In an interview with LitHub, Kazuo Ishiguro has advised writers to let go of genre boundaries, to start with relationships, and Erik Anderson has done likewise. Published by Rescue Press in 2016, Estranger examines an author’s relationships to the many aspects of his life: Family, writing, his conversations with his psychiatrist, strangers, students, editors, colleagues, books; it is an exploration of identity, or self, as required for writers. The work is not to be categorized as a memoir, or in the author’s words, “the ethics of fact and factiousness have no or very little place in these pages, nor should it be a work of fiction” (p. 139). Anderson writes beyond these boundaries, and the recurring theme that runs through the work is estrangement. Estranger is a book that emphasizes intellectual and emotional depth, a rumination on various subjects, such as nature, travel and museums, the films of Werner Herzog, Michael Haneke and Hou Hsiao Hsien, Lao Tzu, Camus’s The Stranger, Thoreau’s journals, Liu Xie, the artists Kara Walker and Cy Twombly; and it is written with influences from W.G. Sebald, Knausgaard, Michael Ondaatje, Rebecca Solnit. Anderson is an author of three books, teaches at Marshall & Franklin College, and is the Writer in Residence & Director of the Emerging Writers Festival. 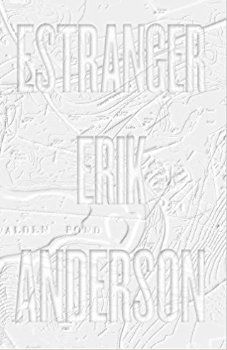 Estranger is mostly to record Anderson’s thoughts, to the point that rumination is a literary device. Throughout we follow a narrator around, we see his physical world, which Anderson connects to an inner world of thoughts discussing books, films, poetry, art. In an interview with Zach Savich, Anderson mentions that “all meaningful action is interior.” I understand this as a dullness in modern life, where reality offers little meaning and even a sense of senselessness, as much as it is a recording of inner life, for a writer is someone who terribly wants to live, whose main task is to struggle with fear and death. Anderson is originally a poet, with a tendency to think inwards and disregard external realities, but over time he finds that his training in academia has become restrictive, with its requirements for scholarly language, abstractions as a measure of intelligence, and where “narrative is practically a taboo.” He finds that his language has frozen up, it does not communicate anything nor is it user-friendly or social, his voice estranged and severed from his body, absorbed by a larger machinery. To resolve this, he builds a structure around his rumination, to anchor himself in real space and time for a physical presence, insofar as readers could better understand an objective reality, a desk, lamp, tree, a situation, and as a reflection of his language estrangement projects himself as a third person, alternating the chapters between the narrator “I” and “He.” And if we were to drop the pronouns, we might call a writer “it.” Anderson means that his words are not a part of him, and he encounters himself, according to Hillary Plum, “as stranger, the stranger as self,” putting himself under scrutiny, like a scientist examining an insect, plant, to overcome fear and human vulnerability. Kazuo Ishiguro has cautioned writers to be sparing with literary allusions as it interferes with a reader’s mind, as he is “against any kind of imagination police, whether they’re coming from marketing reasons or from class snobbery.” Thus, Anderson is in the right direction. Essentially, Anderson is trying to combine poetry and prose and the elements of fiction to make sense of his intellectual background as best he can, while to adhere and be loyal to real life, explore his relationships and himself in the world, for to write thus is to approach literature. This self or self-involvement is a natural state of writers, akin to Socrates’ saying “to know thyself is the beginning of wisdom,” and it is required for writers to meditate on their preferences and where they stand on matters such as race, religion, gender, corporatization etc., for no one could write in a vacuum, but this is sometimes seen as selfishness by others. Thus, in chapter two we read about his visits to Rahim, his psychiatrist, for he faces problems with his wife. To be sure there are writers who’d confuse both, to justify selfish acts towards others as art, but Anderson is only trying to sort out the two and the complexities of family. We also read about his students, writing, as well as an interesting discussion of the film Cache by Michael Haneke, Camus’ psychological death and the democratic uprisings of the Arab Spring, and Freud’s essay on the uncanny. Chapter three is about friendship. Anderson explores his relationship with his friend, Oliver, through a discussion on Herzog’s film, Encounters at the End of the World, and the ideas of Giorgio Agamben, of the relationship between human beings and animal. Their discussion branches into one about children and animal, language and humans, and Oliver’s proposition that “if distinguishing man from non-man has been an endless source of trouble...the alternative is to live between such distinctions, which is to say outside them” (p. 57-8). In chapter four, Anderson guides us through a museum. Here, we read about Naomi, a stranger who becomes a friend, whom by chapter seven would pass away, a reflection on the shortness and strangeness of life. Anderson also describes the guards discussing Malcolm X, his panel discussion and talk on Hou Hsiao-Hsien’s movie Flight of the Red Balloon, as well as his relations with other writers. Chapter five has an interesting discussion on Liu Xie’s book, The Literary Imagination and the Carving of Dragons, useful for writers. To quote, “Liu investigates the mysterious conjunction of wind and bone. To express emotions, Weinberger writes, one must begin with wind; to organize words, one must have bone. He whose bone structure is well exercised will be well versed in rhetoric; he who is deep of wind will articular well his feelings” (p.77-8). The rest of the chapter focuses on a feud between poets, and Anderson’s stand in it, and a discussion of his poems. In chapter six he meets his editor to discuss the criticisms on Estranger. The book ends with a discussion of parenthood, family, old friends, and a meeting with stranger on a plane. Ultimately, Anderson, like many other male writers, is one who sees writing as a state of perpetual aloneness. He has qualms about the family and feels like a failure as a father, but believes that he must not despair about the world for having brought a life into being. While I have reservations, having met male poets who describe their families as burdens but to me it is more sensible to have a stable family in order to be a good writer, as Stephen King in On Writing had said, this book is an honest attempt for Anderson to clear up his values and thoughts on being a writer, and a genuine effort in terms of craft to shift from introspection to external realities. At times it can be difficult to read the Estranger, for Kazuo Ishiguro is right to say that reading abstract and literary writings uses a different part of the brain from fictional writings, but readers interested in discussions of art, film, philosophy, poetry, would find the Estranger a helpful and thought-provoking read.